Foodista | The Best Grilled Corn Recipe Ever! Grilled corn is a labor day staple. This recipe brings this dish to a whole new level of flavor by adding smokiness and spice. I would make this recipe three times over because people will be coming back for seconds and thirds. Step 1: In a blender or food processor, puree mayo with garlic cloves, sriracha, lime juice and cumin until smooth. Set aside. Step 2: Heat the grill to medium high heat. Place the unhusked ears directly on the hot grill for about 7-8 minutes and close the lid. Rotate the ears halfway point to ensure even cooking. This begins gently cooking the corn before laying it directly on the grill. 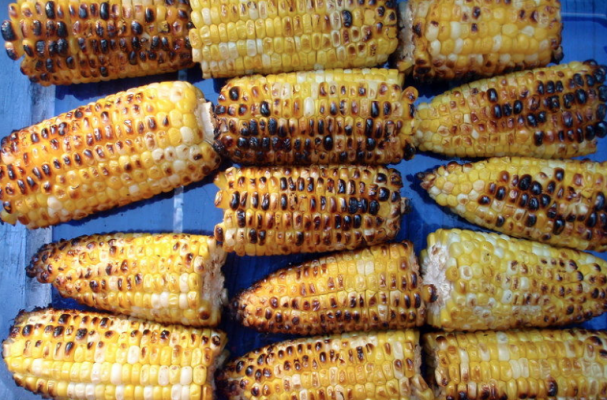 Once husks are brown, gently remove them and cook the corn directly on the grill. Cook until kernels are golden brown. Step 3: Spread the sriracha mayo all over the corn and roll in parmesan cheese. Garish with fresh cilantro.